FOR A GLIMPSE into the sweet, awkward, occasionally terrifying things fans do with their most beloved stories, head on over to L.A.’s own FanFiction.net. Rummage through that cultural yard sale, and you’ll find some gems: In the TV section the spectrum runs from the 90,000 entries for the CW show Supernatural to a single entry for Comedy Central’s old Strangers with Candy. In between are home-spun riffs on soap operas, procedurals, foreign shows, and the ’80s sitcom Night Court. There are categories for movies (topped by Star Wars), games (led by Pokemon), cartoons (Avatar: The Last Airbender), and books (Harry Potter’s 600,000 entries dominate every other category). If you get through all of those, check out the newer ArchiveofOurOwn.org. Or search YouTube and sift (carefully) through Reddit. While fandom like this makes a mockery of the concept of intellectual property, the United States hasn’t ground to a halt under the weight of millions of copyright-infringement suits. Why? Because fan fiction doesn’t just let people play in their beloved worlds; it provides free marketing for the copyright owners. When the status quo gets upset, it’s about money. In 2008, J.K. Rowling, famously tolerant of fan endeavors, sued somebody who tried to turn a popular online Harry Potter lexicon into a book. She won. J.D. Salinger’s estate won a 2009 case against the person who wrote a sequel to The Catcher in the Rye. Pretty straightforward. But a few years ago a lawsuit involving one of the oldest and most venerable fandoms, Star Trek, ended up looking more like a rebellion against an entire universe, and the effects are still being felt. Alec Peters is a lifelong Trek fan. A lawyer by training, he sells memorabilia from sci-fi TV shows to earn a living, and he’s one of those diehards who work on fan productions. The 57-year-old looks sort of like the actor who played a character named Garth of Izar on a 1969 episode of the original Star Trek series. That and the fact that he already had the character’s costume prompted him to make a movie about Garth. Peters, like many of your more intense fans, thought the official story line had gone off the rails with J.J. Abrams’s recent reboot. His goal: to fill in blanks in the original story (a common fandom trope) with a tale he reckoned was closer to what people actually wanted rather than the current slate. What makes the whole thing so bold is how far Peters went. Called Star Trek: Axanar, his feature-length film was to be about a war between the Federation and the Klingons that took place 21 years before the original series, according to Trek “history.” (That’s about the same time period, incidentally, covered in the new CBS streaming series Star Trek: Discovery, which premiered in September.) Peters began a crowdfunding project. Through donations and merchandise sales he raised $1.3 million, hired a director, actors, and a crew, and along the way produced a teaser video—a 20-minute documentary-style short shot on green screen called Prelude to Axanar—and a three-minute scene with two Vulcans. He also put a lot of money into a Valencia warehouse where he was going to build a set to shoot Axanar and other fan productions. In doing all this, Peters tells me, he pondered a larger question: “At what point does fandom take over ownership of the property—not legally but spiritually, canonically?” Spiritually and canonically, it’s hard to say. But legally there’s no question it’s CBS and Paramount, which sued Peters in December 2015. FANS HAVE BEEN creating Star Trek movies featuring homemade phasers and costumes since the earliest camcorders. And some of their projects go well beyond the stories and sexcapades of other fan fiction in this particular way: They blur the line between the “real” and the “imitation” by featuring professional actors. In Axanar, good bits of acting are delivered by actual Trek alums: Kate Vernon, who appeared in an episode of Star Trek: Voyager; J.G. Hertzler from the spin-off Deep Space Nine; and Gary Graham, a veteran of both official and fan productions, who in Axanar reprises a role as a Vulcan ambassador from another spin-off, Star Trek: Enterprise. Were you so inclined to dig deeper, you’d discover Walter Koenig (the original Chekov), Nichelle Nichols (the original Uhura), and Alan Ruck (of the film Star Trek Generations) in a production directed by yet another Star Trek veteran, Tim Russ (Deep Space Nine). Then there are pro actors from other sci-fi properties showing up to delight fans, like the original Battlestar Galactica’s Richard Hatch and Terminator 2 ’s Edward Furlong. These productions are hybrids; they feel fannish at the edges—in the writing, say, or the editing—but offer glimpses of something as good as the official versions. This is especially true in the blend of effects, directing, and editing that you can see in the snippets of Axanar. Over the years the various incarnations of Star Trek’s owners—from Desilu to CBS (which holds TV rights) and Paramount (which holds movie rights)—have generally let fans carry on. And so, at least in certain parts of the internet, fans have gotten to make stories that bump up against the canon. So why the suit against Peters? It’s pretty clear, though, that CBS and Paramount were also concerned with the amount of money Peters raised by the crowdsourcing and the “donations” for Axanar merchandise. Plus he seemed to be setting up a Star Trek-adjacent fiefdom by attempting to build that Valencia studio. CBS and Paramount laid it out in a filing: “Star Trek fans will view the Axanar Works (and donate for the production of future works) instead of paying to view the Star Trek Copyrighted Works.” In other words, Peters’s vision could get in the way of theirs, and their rightful money could end up in his pocket. The two sides settled earlier this year. But before that, CBS and Paramount issued a dreaded set of guidelines for all future productions: Don’t use the Star Trek name, don’t raise more than $50,000, don’t make money off of it, don’t make anything longer than two 15-minute episodes, don’t use professionals. “The fan production must be a real ‘fan’ production, i.e., creators, actors and all other participants must be amateurs,” they decreed, trying to force the genie back in its bottle. PETERS HAS BECOME a hero among Axanar partisans and a villain to people like Vic Mignogna. “Unfortunately all the [Trek] fan productions are victims of the collateral fallout from that,” Mignogna says. A voice actor who lives in Studio City, he is another superfan from way back and looks Captain Kirk-adjacent. He created a series called Star Trek Continues, which accounts for what happens to the Enterprise crew in the decade between the end of the original series in 1969 and the beginning of Star Trek: The Motion Picture in 1979. He launched his production in 2012. The plan was to create 13 45-minute episodes, shooting them in Georgia on a replica of the original bridge built for yet another fan production. Mignogna plays Captain Kirk, Mythbusters’ Grant Imahara is Sulu, and Chris Doohan takes on his father’s role as Mr. Scott. Actor Michael Forest even guest-stars in the pilot, reprising the Adonis character he played in the original series. Mignogna contributed $150,000 of his own money and raised another $540,000 through crowdfunding. He edited the episodes at his home and on the road during his frequent convention appearances. (He’s an anime mainstay who has voiced characters in Fullmetal Alchemist, Dragon Ball Z, and a bunch of others.) They look remarkably good, too—true to the low-fi charms of the original, with the sandy-haired Mignogna finding the sweet spot of long pauses and thoughtful emoting that puts him closer to channeling Shatner’s Kirk than imitating him. 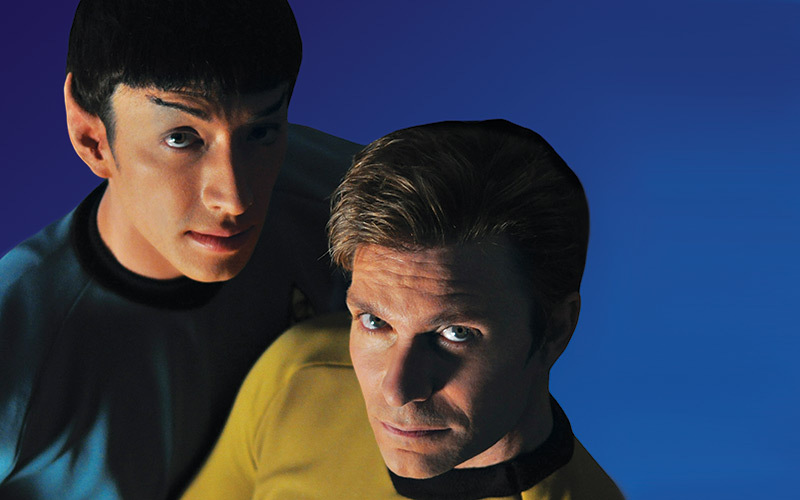 Since the guidelines dropped, Mignogna had to abandon the idea of producing the 12th and 13th episodes of Star Trek Continues and wrap the series up in 11. The last episode should be airing on the show’s site and YouTube right about now. “We will be doing what has never been done,” he says, “and that is finishing the five-year mission and bringing an actual series conclusion to Star Trek.” That Star Trek appears in the title and that he used pros suggests CBS and Paramount can overlook projects at their discretion. Another Trek fan production, meanwhile, was canceled, and one originally called Star Trek: Renegades sidestepped the guidelines by scrubbing references to Star Trek from characters’ names, costume designs, and plot points. It goes boldly forward simply as Renegades, starring Walter Koenig as the Chekov-adjacent character The Admiral. But the fan machine is whatever the opposite of a black hole is, unstoppably pumping out tiny universes. By at least one count, there have been anywhere from 50 to 100 Star Trek fan productions made post-guidelines, most of which still carry familiar branding. TV-rights owner CBS, which declined to comment on this whole crazy thing, hasn’t said that it will act on a violation of the guidelines, only that it can. To regain some control of narrative (and perhaps try to spare itself the hassle of further litigation), CBS announced this past August at the big Star Trek Official Convention in Las Vegas the advent of a Fan Film Academy. Starting next year, fans will be able to learn about filmmaking and special effects, using CBS-sanctioned scripts on a CBS-sanctioned set in New York. Since it’ll all be safely contained and unlikely to contaminate any official timelines, the academy will be another alternate universe: a camp where a fan can pretend to be a fan filmmaker, where fandom itself is the story being imitated. Most civilians, of course, are aware of none of this and think Abrams did a fine enough job with his versions, when they think about it at all.